A412 Eveready 412, BLR122, B122, 15F20, NEDA 215, ANSI 215, BA 261/U alkaline batteries. Type: Alkaline. Voltage: 22.5 V.
Height: 50.8 mm. Width: 15.9 mm. Length: 26.2 mm. Price: £15.75 each. £15.45 each if you buy two or more. Postage and packing included. Also known as: Eveready 412, 15F20, BLR122, B122, NEDA 215, ANSI 215, BA 261/U, M2152, Mallory M215, Mallory M122, RCA VS084, Varta V72PX, Burgess U15. The A412 (or Eveready 412) is a alkaline replacement for the once popular carbon zinc battery that was commonly used in AVO meters and in vintage Knight transistor testers. 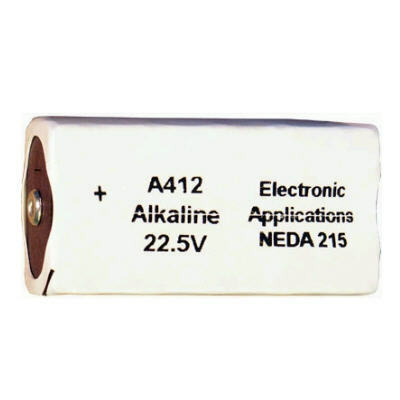 The A412 (or Eveready 412) cells produce 22.5 Volts and has contacts on each end. It is widely used in vintage collectible transistor radios such as the Regency TR-1. The A412 or (Eveready 412) is likely to be your only choice of battery replacement. Consider buying more than one. These Alkaline cells have a shelf life of several years, so buy two and make sure you always have a ready supply of power for your device whilst taking advantage of our reduced price multi-buy offer.